Big Day Out is my favourite yearly music festival. Held on eight or so huge stages (usually on show-grounds), a bunch of amazing bands of different genres rock out all day. Over the years BDO has hosted some awesome rock band headliners- from Tool, Nirvana, Foo Fighters, Muse, Red Hot Chilli Peppers, Ramstein, Silverchair, and Powderfinger- truly more than enough to keep me dancing all day long! I was so excited when I heard that Soundgarden were to be one of the main acts at this years BDO; I was literally online the minute they went on sale! 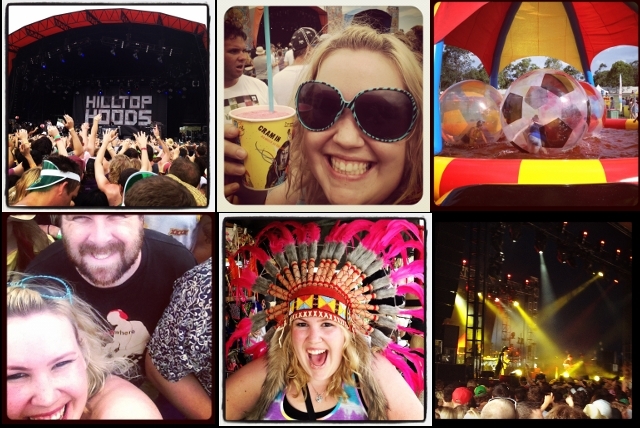 I was also super excited to see Hilltop Hoods, Bluejuice, Kimbra, Drapht and Kasabian. Ben wanted to own the mosh pit at Art vs Science and we were lucky enough to discover Boy and Bear when we caught the last of their set. 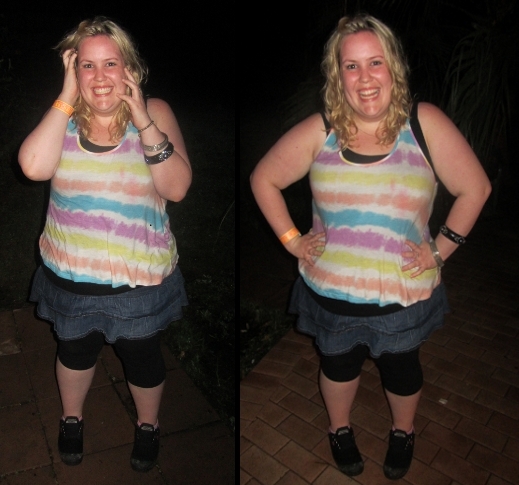 This piccys were taken at the end of the night- sweaty and covered and in all sorts of BDO goodness! 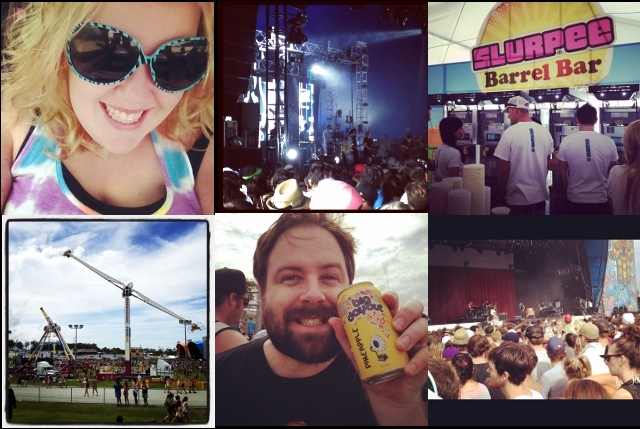 At the bottom is some of my Instagrams from the day as well as my favourite photo I took in Soundgarden mosh pit! omg Olivia-- this looks like FUN! I love the headdress on you too, btw! you must make it a permanent addition to your wardrobe! Sent your necklace yesterday, btw! Hope you like it!!!! yayyyyyyyy!!! can't wait to get it!!! you guys look like a blast!! Well if you're ever in Brisbane I'd love to show you around! Summer is definitely my favourite season! It looks like you had an amazing time. Haven`t been to a festival in ages. I miss Festivals, I haven't been to one since 2009, the older I get the less I can handle it - I know how lame that sounds lol, I'm not even that old. When I was in high school I use to go to this one music festival every year, it was so much fun and I was so painfully shy. I'm extremely envious of the slurpee bar, I looove slurpees. It sounds like you had a wonderful time, you are the lady that has all the fun hehe. I love your tank top, sunglasses, and the way you have your hair in these pictures - you look so cute. You are rocking that head-dress! For seriousz. awww thanks! I love slurpee's too! I love the colours in that tank, so pretty! Looks like you had a great time, gosh I love your smile! Aaah I love that headdress! :D Such a cute outfit too - love that striped tank! I am so glad you are having so much fun, my gorgeous. That concert looks like a blast! I would love to follow eachother! Thanks Vivi- nice to meet you! I'm a big fan of boy and bear- glad you like them! Cutee outfit too!